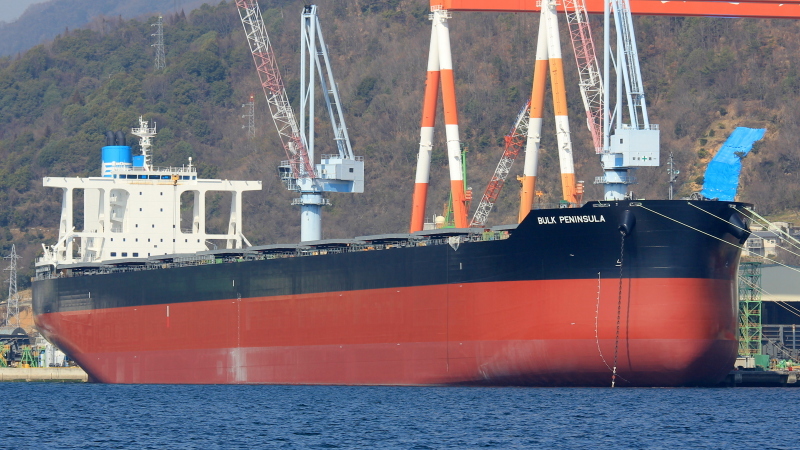 New bulk carrier fitting out at Imabari shipyard at Aki-Saizaki near Mihara, in Hiroshima Prefecture. Info on her IMO number welcome. Thank you for your comments and information, Peter and MS3866! Her IMO number is 9839014, according to Marine Traffic. AIS sign has been caght at Imabari Shipbuilding Hiroshima factory. Thank you all for your comments. I will make sure to keep posting here, just like I will continue to enjoy the work of other ship spotters. Keep them coming Vlad, congrats on your 5K, now looking forward to your next 1000. The paint job on this vessel is fabulous,no rust.More so,all the red color will be under water when she is fully loaded and this will ask for a lot of HPs to sail at 13 knots. Your photographs continue to keep ship enthusiasts world wide up to date on the new larger vessels entering service. It is truly appreciated. Also congrats on your 5.000th pic. I like your pics very much, especially the newbuildings. This photo has been shown 1,138 times since it was added to the site.